Welcome to the latest instalment of the SSLR! Last time I explained the construction of the baseboards, and talked about presentation; today it's all about trackwork and wiring. And be prepared, it's a long entry! Before we get started, I think it'll help to remind you all of the track plan. As you may remember, the lack of space for a run around led to an interesting track layout. It's fair to say there isn't much choice out there for ready-made crossings, which meant I had to have a go at scratch-building my first piece of track. Usually you'd expect someone to try a simple of bit of straight track for their first scratch-build, but naturally I was keen to press on; and armed with a very useful guide (only viewable by NGRM-online members I'm afraid) by Ted Polet, this was achievable. Above: Firstly, the rest of the track should at least be temporarily held in place to stop it moving (if only I'd done this, as the loco headshunt does have a slight kink now!). You can then place a bit of copper clad board and mark on the centre lines for the two tracks that will cross over. Above: The copper clad board can then be cut along the lines. As you can see, it doesn't need to be exact, but it does need to be close enough. Above: Next up, some sleepers were removed from one of the tracks, and the first rail was spot-soldered into position. Using the least amount of solder as possible, and only a quick touch with the soldering iron means that the rail is easier to move if placed in the wrong location. 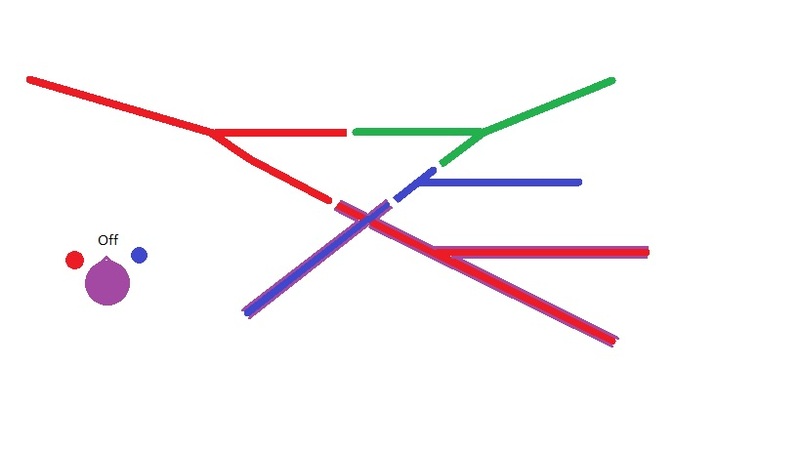 Above: A line can then be drawn onto the board to mark the location of the first rail from the other line that crosses over. This rail can then be notched over the other rails' web, mitred to the right angle, and then cut to length and spot soldered, keeping it as parallel to the existing track as possible. Once I was happy with the location of both rails, they can be soldered down their entire length to ensure maximum strength. Above: This rail can then be continued over in much the same fashion; always spot soldering before final full-length soldering, then followed by the rail closest to the camera. With this one, I've relied on the sleepers to hold it at the right gauge on one end, meaning I only had to check that the far end was the correct gauge. I'd advise investing in some proper gauges, but all I had available was a spare wheelset and a metal ruler which seems to have done the trick. b) melting the solder elsewhere causing a rail to move out of place! The first one could be solved by using a copper clad sleeper in place of the plastic one, the second is harder to solve; hence the initial spot soldering. Above: Now it was time to place the trickiest of all the rails! The key here is to be quick with the iron, and to use something that you fit between the track to temporarily hold the rail with on one side. I chose a piece of styrene, which may seem odd given the fact it is likely to melt with too much heat, but as I said, the key with the iron was to be quick, and not to hold it on the rail for too long! Above: With the final rail soldered where it should be, I could then try and produce some form of checkrails. For some reason, I just used whatever bits of rail were left over, resulting in a mess of random length checkrails! You could do a much neater job than me (and let's not talk about my lack of soldering ability, please!) Anyway, these were simply bent at the ends using a small pair of pliers, and then notched and mitred much in the same way as the rest of the rails. It's at this point that you may have noticed that my lack of neat soldering has meant some of the check rails are too high. Whilst I eventually used the Dremel to grind them down, a better bet would be to try and clear some of the excess solder of the copper clad board, or if you're really lazy, just notch the web out of the bottom of the rail! Above: The end result is a lot of messy soldering, but it works, and that's the main thing! Bear in mind I didn't have any way of cleaning the soldering iron tip, so that might be the reason for some of the messiness! Above: With the rails all in place, it was time to cut the gaps and form the flangeways. To do this, a combination of a fine-toothed track saw, and a Dremel with a sanding disc was used; being extremely careful both to not cut the flangeways too deep, nor too wide! If either of those two things happens, any rolling stock will fall into the gap and likely cause a derailment. These gaps were cut as little at a time as possible, and each cut was preceded by a checking of how a short wheelbase wagon performed over the crossing. Once the wiring is done, this will obviously need to be re-checked with locomotives, and the gaps fettled accordingly. 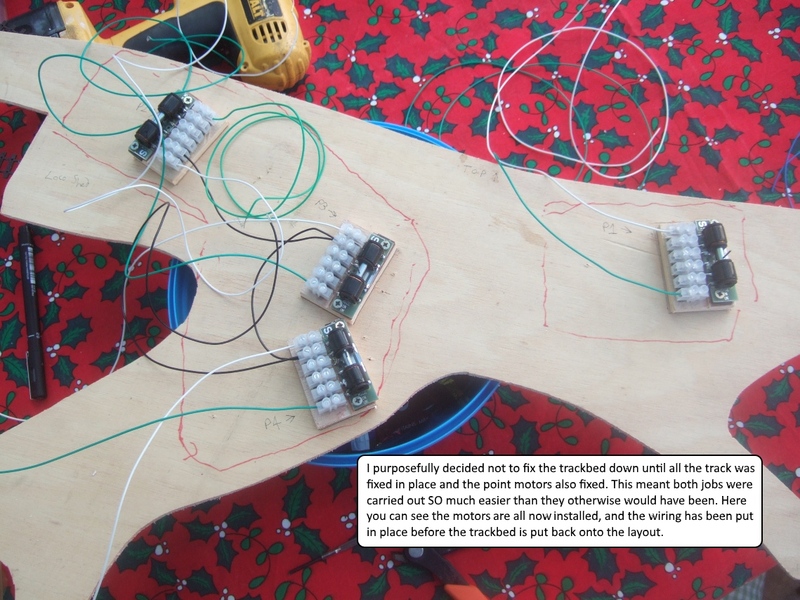 Thankfully, the rest of the trackwork was straight forward - standard Peco 009 flexible "crazy track" and points were used, which meant very quick progress. I have never used cork or any other form of underlay; primarily because any sound deadening would be negated by the time the time you've ballasted and created infilled track! Ultimately, just go with the techniques you prefer, and if you're unsure of something, ask someone! The track bed is solid, and made of something unlikely to warp or react to moisture - I use 6mm ply that is supported on softwood blocks wherever needed. If curves are particularly sharp, consider making/buying a rail bender and pre-bending the rails for a smooth curve. When forming curved sections of track (particularly just after pointwork, or after a rail join), that you keep at least the first couple of centimetres to be straight before beginning the curve. This will allow you to form a naturally smooth transition, and will reduce the chance of kinks on the rail join. (This is another reason for soldering rail joins). You keep glue away from point blades, and especially point motors (both when laying the track, and when ballasting). Being able to lay the track on a separate ply trackbed for as long as possible before permanent fixation will mean you can work on the trackwork and wiring away from the layout (no more leaning over and no dodgy neck/back!). Any joins between boards, or turntables/sector plates etc. should have the last 2 sleepers on each side replaced with copper clad board. The rail can then be soldered (with the track as straight as possible) over the join and onto the copper clad boards before being cut with a Dremel disc or similar. This should of course be done when the 2 boards are fixed together in their final positions. This results in a perfect track join every time. 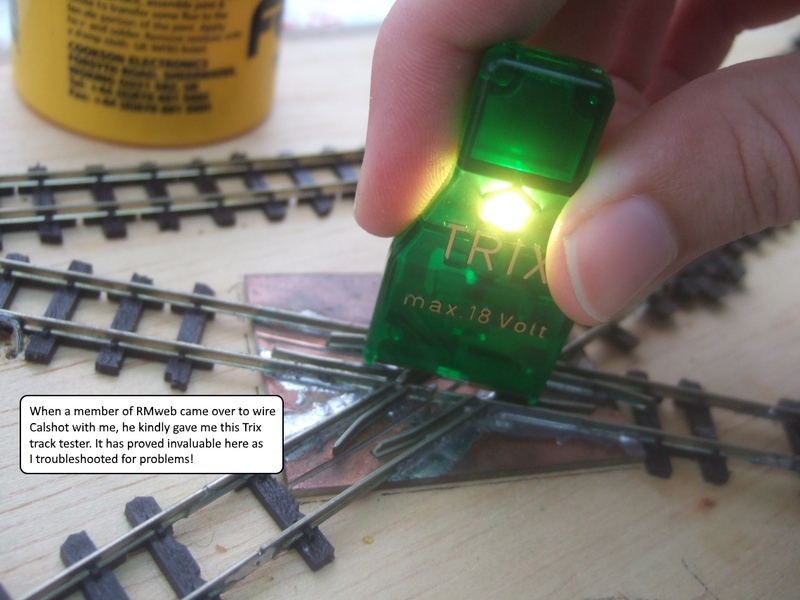 You use a suitable glue (not track fixing pins!) to fix the track down. I suggest PVA as holds strong when left overnight to cure, yet is easy to get a thin knife underneath to remove should it be necessary. You weigh down the track with weights whilst the glue cures, preferably for 24 hours. If a section of track is under high stress (i.e. sharp curves), you can use push-pins to hold the track whilst it cures. So, now that the track has been carefully laid and has been tested with some rolling stock (you have done that, right?! ), it's time to begin the wiring. I hope you haven't stuck that trackbed down yet, as the first step is to fix the point motors in place (assuming you're having some). The choice of what point motor you use is up to you, personally I prefer the Gaugemaster SEEP motors as they're nice and compact. Above: With apologies for the festive table cloth! All the point motors were fitted with the trackbed upside down; this meant I could wire them up with ease. Note how I've actually made a ply base for every point motor, which is stepped slightly so that the connector blocks can be directly attached (at the right height) to the point motors. This means any wire or point motor can easily be replaced should one fail for whatever reason! It's also worth noting the red markings that denote the holes in the baseboard, as well as the labelling of each point motor so that fault finding and wiring is quicker and less confusing. Hard to spot, but I've also drilled small holes in the trackbed for 3 feeds per point (frog, and two approach rails). Above: Here's the control panel for Sandy Shores, with appropriate legend. Note how the labelled points correspond to the labelling under the trackbed in the previous photo! The control panel may seem very busy for a layout with only 4 points, but it is designed so that multiple locomotives can be on the layout at the same time without fear of one of them rocketing off the end of a headshunt and onto the floor! We can see that the layout is split into colour coded sections that can be turned on or off; green is the fiddle yard and platform road, and red is the water tower line and siding headshunt, blue is the locomotive shed road. There is also a separate rotary switch controlling the tracks that cross-over; purple for the shed headshunt, and orange for the sidings. We'll see why later. Finally, there are isolation switches on both headshunts to give further scope for interesting operation, and 3 push-to-make buttons in the fiddle yard to prevent accidental locomotive runaways! But how on earth do you wire this up? Above: So, firstly, don't be alarmed - it may look monstrous, but when you break it down, it becomes easier to understand. Top right shows the point motor wiring - very simple, only 3 wires; black is common to all and runs via the CDU, and green and yellow determine which way the point is set. 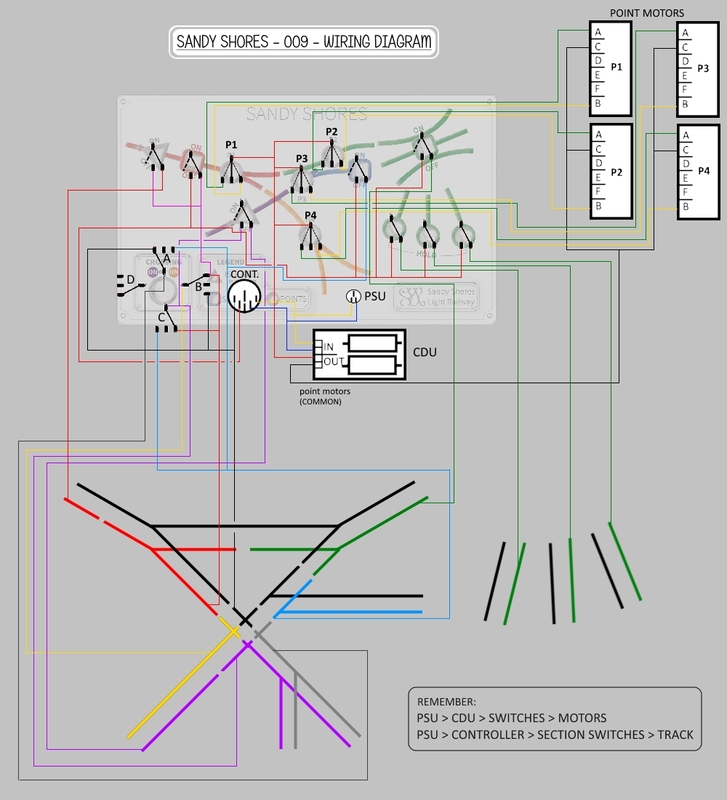 The crossing does complicate matters slightly, but it has been wired to a 3 pole rotary switch to allow switching between an "off" state, the locomotive shed headshunt (blue with a purple outline in the diagram below), and the sidings (red with a purple outline in the diagram below). These two diagrams and the brief explanation below are courtesy of Michael Campbell - for which I am most grateful! A is always common, but still needs to be isolated from the point frogs to avoid shorts. The wiring to achieve this with the 3 poles of the same switch is shown. The siding tracks are dead when that route is not selected as both rails are the same polarity - rather like a live frog point isolates the route not selected. It's still possible to get a short if a loco approaches from one of the points if the switch is not set for that route, so it isn't fool-proof. The spare pole of the switch could light up LED's to show the selected route, or switch a dead-section in the common rail on the approach so a loco stops rather than shorting. Above: And now we've got the wiring figured out, we can turn it into reality by wiring up the control panel; which is fixed to a piece of hardboard via bolts and nuts so that the back can be accessed for wiring! As it's obviously reversed, we have the 3 fiddle yard push-to-make switches on the left, the power supply connector bottom middle, followed by the CDU (for the points). On the far bottom right is the rotary switch for the crossing, with the controller connector above it. Anything labelled P are point switches, anything labelled ISO are the isolating sections (on the headshunts), which leaves us with GS (green section), BS (blue section), and RS (red section) for the different track sections. As the caption says, the trackplan is drawn on for convenience! 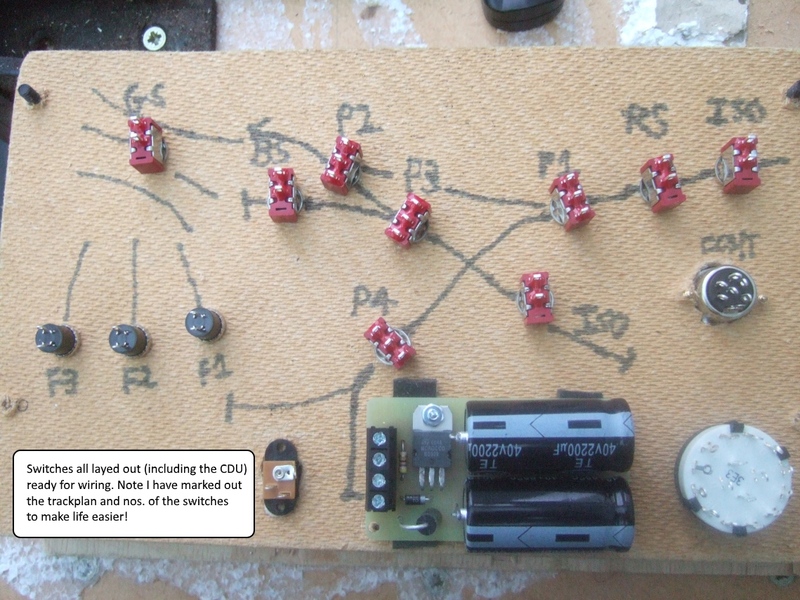 Above: The caption shows what's going on, but it's worth noting that the common feeds for the point switches and sections are in red wire, not black as would be expected from my earlier comment. 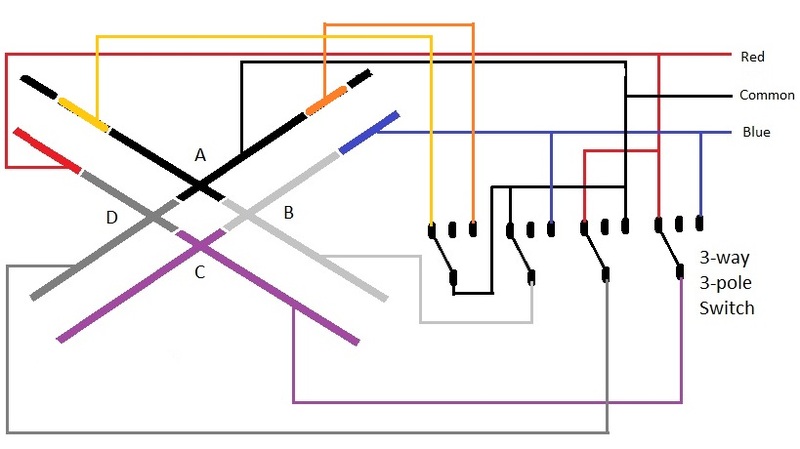 Where possible I have kept the wiring to the same colour code as the diagram - sometimes there just aren't enough colours! As you can see, common wiring runs from the centre pole of the point switches to the CDU, and from the lower pole of the section switches to the controller (which itself gets its power from the power supply via the blue and yellow wiring). Above: A little while later and the rest of the wiring is in place. Note how the section switches (GS, BS and RS) have appropriately coloured wiring! 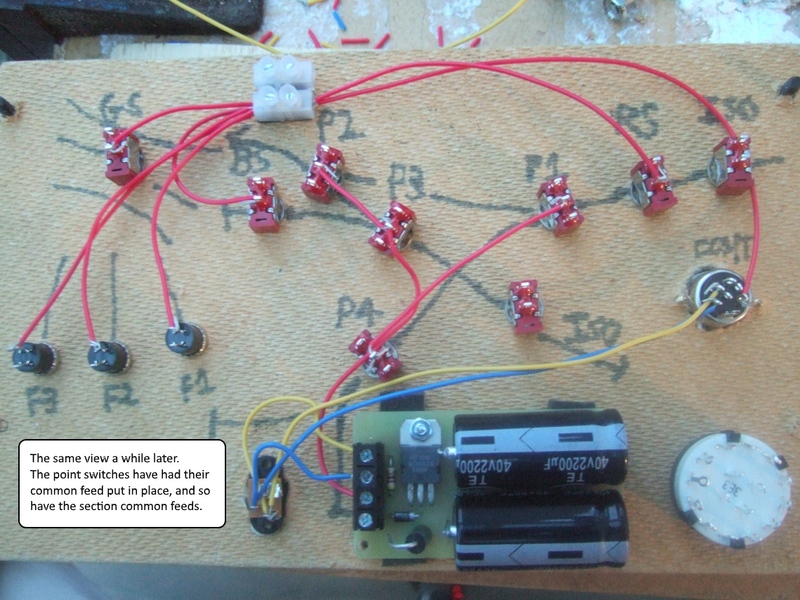 If in doubt, consult the wiring diagram! Above: With the wiring complete, it was time to run final tests. Note one of the crossing feeds on the far middle left, as well as all the soldered rain joins. So there we have it, one wired layout! 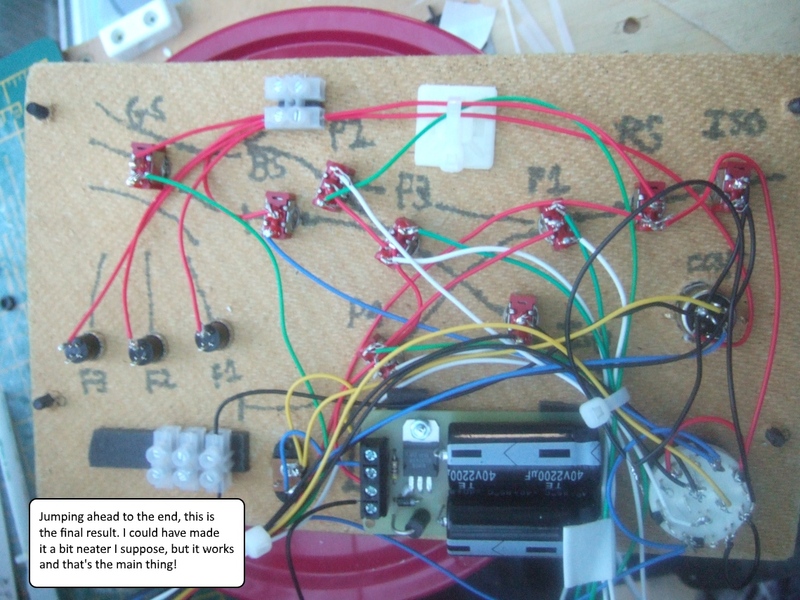 I appreciate the wiring aspect was probably very difficult to follow, but I hope that if nothing else this entry has proven that even with very limited skill and experience, as long as you are methodical you will get there eventually. And that if you ever needed help, there's usually someone on a forum that is more than willing to help! If you have any questions, comments, or need further clarification, please feel free to comment below. 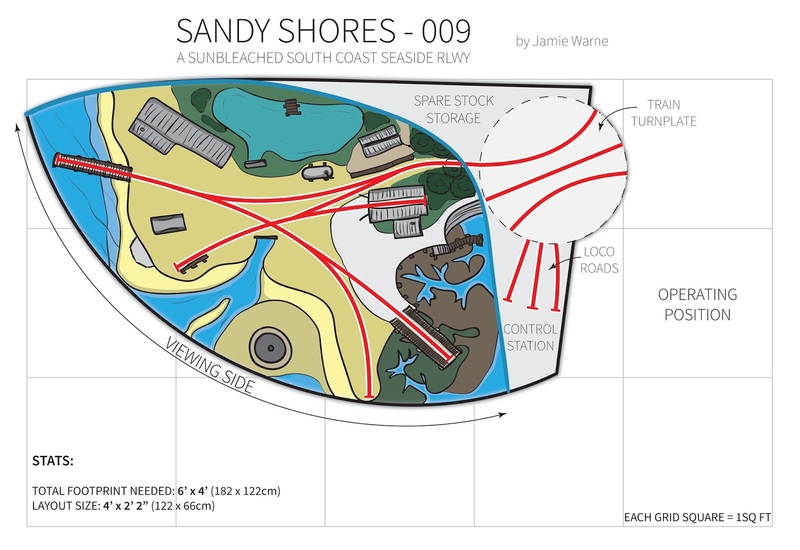 My thanks to Ted Polet and Michael Campbell for their help and guidance for the wiring and trackwork on Sandy Shores, oh and to JohnDMJ for the practical demonstration when he showed me the ropes with Calshot all those years ago (and for the Trix track tester)! I must have missed this earlier. What a post! Congratulations on getting the crossing done, must be one of those jobs where you just need to take it one small step at a time (come to think of it, that applies to all modelling doesn't it). The graphics on the control panel are great, different from the boring ones we normally do. Track Laying & Wiring | Includes my first bit of handbuilt track!